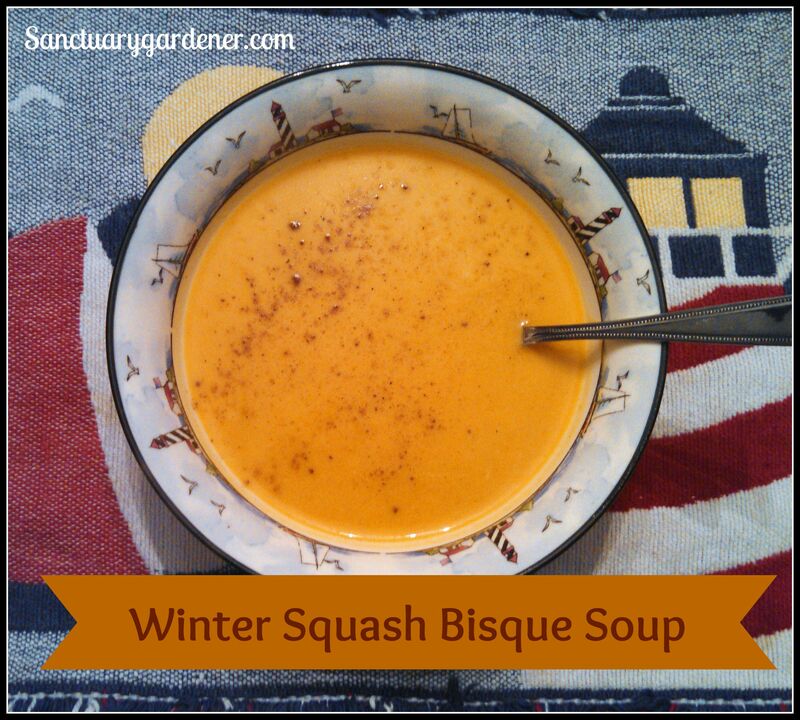 Yesterday, I decided I wanted to come up with a recipe for bisque soup, using my Black Futsu squash. It is a winter squash that is a little sweeter than butternut squash. This recipe is what I made last night for supper, served with beer-cooked beef brats (thanks to my Garden Wilson) – a totally autumn meal! It was a hit around the table! Definitely a keeper – and a sharer. Let the squash cool, then spoon the flesh from the rind and put into a bowl. In a dutch oven or small soup pot, saute the diced onions in the coconut oil, until they begin to soften. Do not let them brown! Add the chicken broth, roasted squash, and spices. Stir together well, and bring to a low boil. As soon as it boils, cover the pan (with the lid slightly ajar), and lower the heat to simmer. Simmer for about 30 minutes, stirring every 5-10 minutes. After the soup has been completely pureed, put it back into the soup pot. Turn the heat onto low and add the half & half, stirring as you add it. Keep the pan on the heat for a couple of minutes – until the soup is very well blended. Serve with a sprinkle of nutmeg. If you decide to make this soup, comment below with what kind of squash you used and how you and your family liked it.